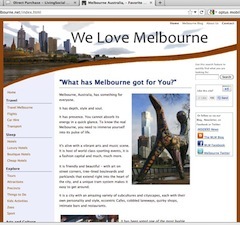 We-Love-Melbourne.net is a SBI website. SBI! stands for Site Build It!, a website program that enables you to create a successful online business without much technical know-how or knowledge. Applying the easy to use SBI!-steps, we were able to pull of the dream of the We Love Melbourne website. We are neither web designers nor computer wiz  and did not need to study Search Engine Optimisation or other web building programs. The step by step SBI! Program is broken up into foolproof modules that give you all the tools to create, not only an interesting website, but also a website that will be found by the search engines. Tools include modules for honing in on a workable topic, finding keywords that get found, how to get traffic, and ways of making money with it. SBI! has been developed by Ken Envoy, one of these very special people who over-deliver and believe in quality, not shortcuts. What you get is priceless and many times more valuable than its cost. A Win - win game, which has given freedom to many people. With a website build with SBI program, many ordinary people have been able to build successful and income producing websites and solid online businesses in their personal niche. If you have a project simmering in the background, waiting to come out, I highly recommend you have a look at SBI!  Nothing to loose with a solid money back guarantee! Definitely not instant wealth, but a steady and sure approach to online success! For this reason, we are happy to recommend and endorse the SBI program.